Pixie-bob Cat Pendant in 14k Gold Also available with gemstone eyes! Jewelry artist Kay Fazio has created this Pixie-bob Pendant in solid 14-karat gold. The pendant is approximately 1.75 inches long from her stubby bobtail to the tip of her polydactyl paw. This is a solid, muscled cat with a pinch of attitude. Weighing in at approximately 12 grams, she is also available in .925 Sterling Silver. Fazio takes pride in every detail of each breed she replicates. As with all of her cat jewelry, each piece is custom carved, individually cast and hand finished. About This Breed: The relatively new Pixie-bob breed was developed in the 1980s and was recognized as a breed by TICA and the ACFA in the 1990s. To be shown as a Pixie-bob, the cats must be descended from "StoneIsland Pixie", the breed’s foundation cat. Pixie-bobs resemble the North American Bobcat. Kittens continue growing for 4 years, versus the 1 year it takes most house cats to reach mature size. Their tails may be bobbed or long. Pixie-bobs have a patterned coat and a distinctive pear-shaped head. 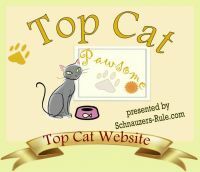 The bold cats are very intelligent, social, and active. They don’t meow, but make an assortment of chirrups, chattering sounds and growls instead. Be aware that this is hand-crafted jewelry and the artist will make it after you place your order. These are not sitting around in a warehouse somewhere waiting to be shipped. Depending on her workload at the time she receives the order, it may take up to a month for you to receive your pendant. If you have an occasion approaching, be safe and order early!